What’s an orb weaver anyway? Some kind of spider that weaves large round nests! This one drew my eye because of its bright orange color. Who wouldn’t notice that bright color crawling on the ground? It tried to hide from me by creeping under an herb but I wasn’t done inspecting it yet. 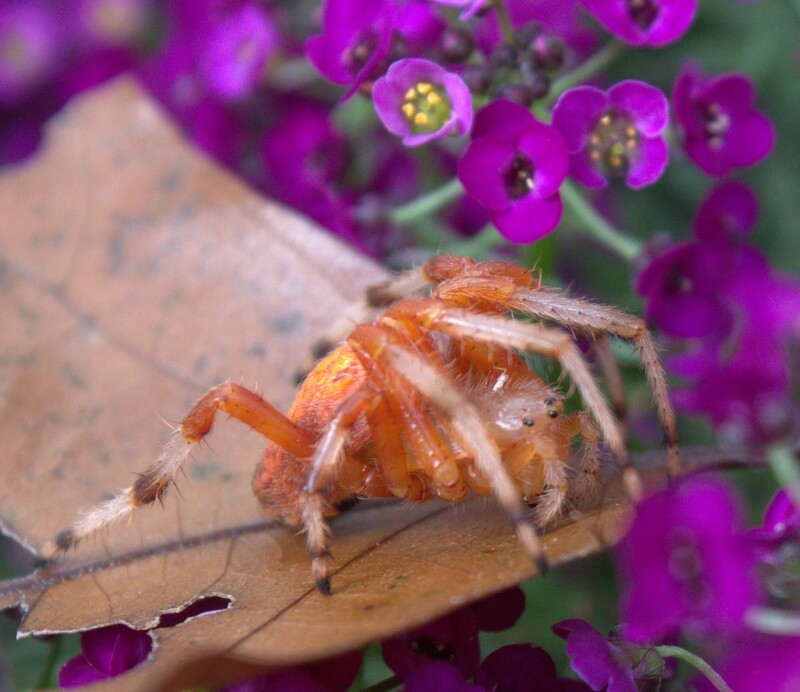 I scooped her up with a brown oak leaf and carefully placed the spider among the purple and white flowering alyssum next to the garden. 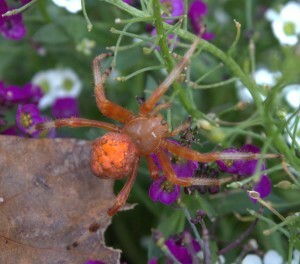 This orb-weaver was also a big spider — on the size of a mature garden spider. Not tarantula big, but it was larger than most house spiders. It turns out this is a fairly common spider known as the Marbled Orb-Weaver, Araneus marmoreus. It’s a member of the spider family Araneidae, which includes thousands of species of spiders. 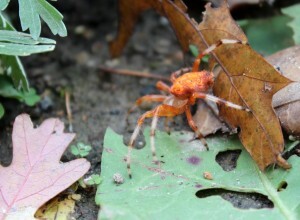 The orange color may make you think this spider is toxic, but it’s not. Not dangerous or toxic to you or your pets. Adults do not overwinter. The species survives winter as eggs protected by a silken cocoon. Young spiders emerge from the cocoon in spring and grow into the adult forms by the middle of summer. Adults can be seen then until the first killing frost in autumn. As gardeners we try to leave spiders alone. Sure, they’re kind of creepy and some people are quite afraid of them, but they do have a job to do. When that involves eating some of the garden pests, or irritating buggers like mosquitoes, I’m all too glad to let them live. Go free! Eat and be merry! 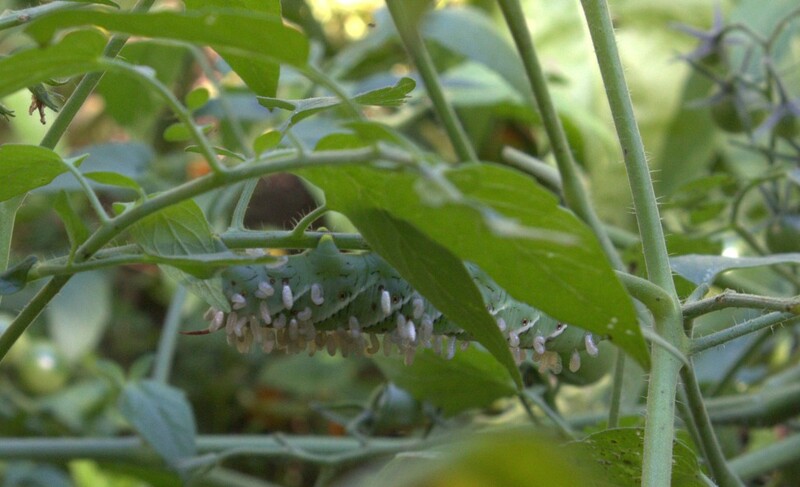 Tomato Horn Worms are so gross. 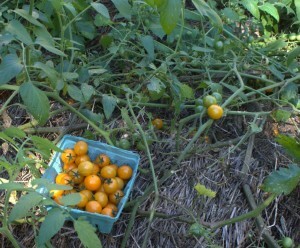 Big, squishy green worms with busy mouths that won’t cut tomatoes a break. 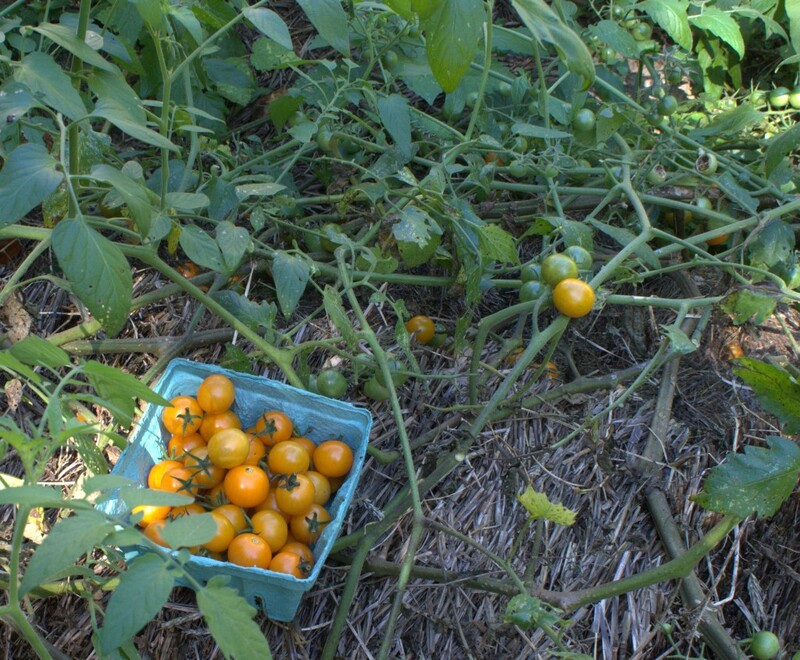 The other day I harvested yet another quart of cherry tomatoes from the garden — that Sungold Cherry Tomato has been producing like crazy! I noticed a few green tomatoes that were half eaten and right away I knew the culprit was the dreaded Tomato Horn Worm or one of its brethren. Several big green caterpillars that get in the tomato patch might be called horn worms. They sure are big and kinda gross. I found 3 of them. Two were thrown out of the garden by first ripping off the branches they were clinging to and tossing them on the gravel drive. Hopefully, they became bird food or some opossum came by and had a late night snack. 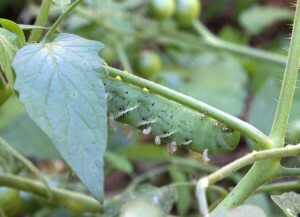 The third caterpillar I left hanging from that cherry tomato vine. 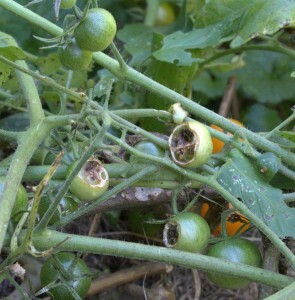 It had already been infected with wasp eggs. Sure, I’ll promote more of those little buggers to live by letting them feast on the caterpillar after they hatch into grubs. 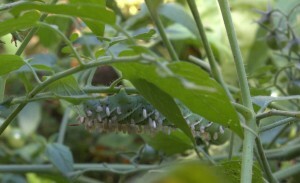 The close-up view of the above image shows some of the grubs have already spun their cocoons. Not all wasps are our enemies. Braconid wasps lay their eggs on horn worms. The immature wasp grubs will consume the caterpillar as their first food. Then, there’ll be more wasps in the future to help control these big green caterpillars.